Surprisingly, people who listen cannot even tell them apart sound wise. Yamaha has superior smooth moving valves. It is lighter and I feel it is more responsive - dynamics of sounds responds to the air stream. It sounds darker or muted when I play lightly and "rings" when I play strongly. Perhaps it is easier to play and it produces more precise and targeted sound. FirstAct is heavier and produces a more uniform strong, bright sound. I feel it is a bit more prone to moisture accumulation. I would say it is more "free blowing" compare to Yamaha. It is not falling apart after a decade of neglect and still shiny. I would concentrate practice and playing on the Yamaha, but keep the First Act. It could serve as a 'back-up' horn if the Yamaha wasn't available, or as a 'lender'. Play the one you want. The biggest difference is in how the First Act will hold up over time compared to the Yamaha (it won't) and the ability to get repair parts (you can't). Also, play the Yamaha. It's an actual trumpet made by people who know and care. I'd be surprised if you First Act holds up to more than a year or more of solid constant use. Usually the materials used on those are laughable cheap and flimsy. the OP said the First Act "is not falling apart after a decade of neglect and still shiny. " My question is more about learning on "proper" instrument (with "correct" intonation, "slotting", dynamics etc) vs TSO. Will FirstAct playing be counterproductive and create "bad habits" etc? Or any two trumpet models will play differently and it is OK and nothing to worry about. I went Caroling with this tune and was not able to put my trumpet down ever since. If you don't experience a downside to the First Act at the moment, and you enjoy playing it, then play it. You might reach a point some day when you detect that the First Act is holding you back, and you might not. You own both, so play whichever one you want. But that being said, if I had a student in the same situation I would tell them that assuming the Yamaha is mechanically sound, play that one. It’s without a doubt a better instrument (look at the list prices of each, what might that tell you? ), why play the other? I have no idea what your current skill level is, but if you’re fairly new to trumpet, you might not yet (YET) be in a position to know which one plays better. I've liked all the Yamaha student horns I've played. And from what I can tell they are consistently well made and sturdy. No idea about the First Act though I'm skeptical that. All that says to me is that it hasn't fallen apart in the case over the past ten years. It doesn't say anything about regular use and that it's held up to that. Welcome to the Trumpet Herald! To get it to post properly, I went to the URL you entered, which took me to the imgur page with your picture. I then right-clicked the image, choice "View Image" and then copied the URL for the actual image (not the imgur where the image appears). I put my FirstAct apart for storage. 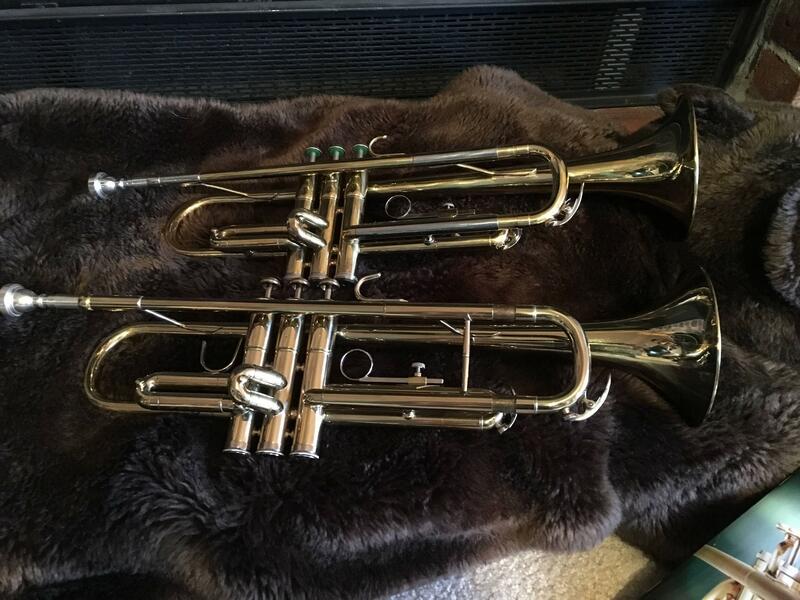 Selling it make little sense and it may also have nostalgic value as my first trumpet. Orpheum Elite in Bb from 1930's ? Nothing wrong with first act trumpets just like most of the budget price Chinese offerings.